Imagine supports children and families coping with loss and fosters resiliency and emotional well-being for all those who grieve. We do this by providing education and free year-round peer grief support for children age 3-18, young adults 18-30, and their parents and guardians, who are coping with loss due to the death of a parent, brother or sister, or other important person in their life. 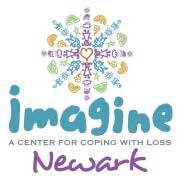 Imagine Newark is founded on the belief that every child deserves the opportunity to grieve in a supportive and understanding environment and that the role of peers and a caring, healthy adult in the life of a grieving child is critically important. Imagine supports and enhances the lives of grieving children and teens at a critical time in their development. The death of a family member, or other painful loss such as divorce, separation, abandonment, parental incarceration, is a time of crisis and, if handled with love and support, can eventually become a process of growth, healing and transformation for children and their families. At Imagine we honor and encourage the safe expression of all feelings associated with loss and provide an environment in which participants develop lifelong healthy coping skills and make meaning from their loss that allows for growth and transformation. Imagine uses the peer support group model, the healing arts, physical play and movement, service to others, community gatherings, and teen and adult retreats, to provide a safe and healing environment for coping with the painful feelings that accompany loss. Children, teens and adults learn lifelong healthy coping skills, build on their natural resilience, and make meaning from their loss that allows for growth, healing and transformation. Would you recommend Imagine Newark?